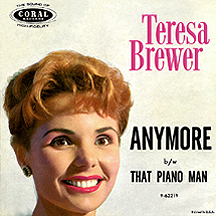 The most subtle example of a show biz name change may be that of Teresa Brewer. She made but two alterations to her given name: dropping the "h" in Theresa and changing the "u" to a "w" in Breuer, resulting in a more common spelling that retains the original pronunciation. I don't know if this made much of a difference, but it certainly didn't cause any negative aftereffects (such as when Dionne Warwick added that dreaded "e" at the end of her last name). Theresa, Teresa, whatever...she was one of the hottest singers of the 1950s regardless of spelling peculiarities. There was never any need for voice training; her big little voice got her a spot on a radio show in hometown Toledo, Ohio at about two-and-a-half years of age singing "Take Me Out to the Ball Game" and being paid in the preferred legal tender for a child that age: cupcakes, courtesy of the bakery that sponsored the show. For several years in the '30s and early '40s she appeared on Major Bowes' Original Amateur Hour radio program (forerunner to Ted Mack's TV version in the 1950s), singing, tap dancing and turning on the cuteness that fans of the show could only hear and not see. She left the show and returned to Ohio in 1943, already having logged ten years as a professional singer and not yet quite into her teens! When she was 16 a singing competetion in Toledo resulted in a return trip to New York, and a shot at a bigtime recording career became a reality within a couple of years. 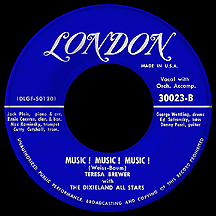 Signing a contract with London Records in 1949, Teresa's release of the jazzy '30s-style "Copenhagen" with The Dixieland All Stars seemed promising, but it was the record's flip side, "Music! Music! Music!," written by Stephan Weiss and Bernie Baum (who, with Bill Giant and Florence Kaye, wrote many songs for Elvis Presley), that struck a nerve with radio programmers and the juke box-playing public (a sizeable lot in those days) who loved the song's catchy 'Put another nickel in' opening line and the suggestion of 'I'd do anything for you, anything you'd want me to.' 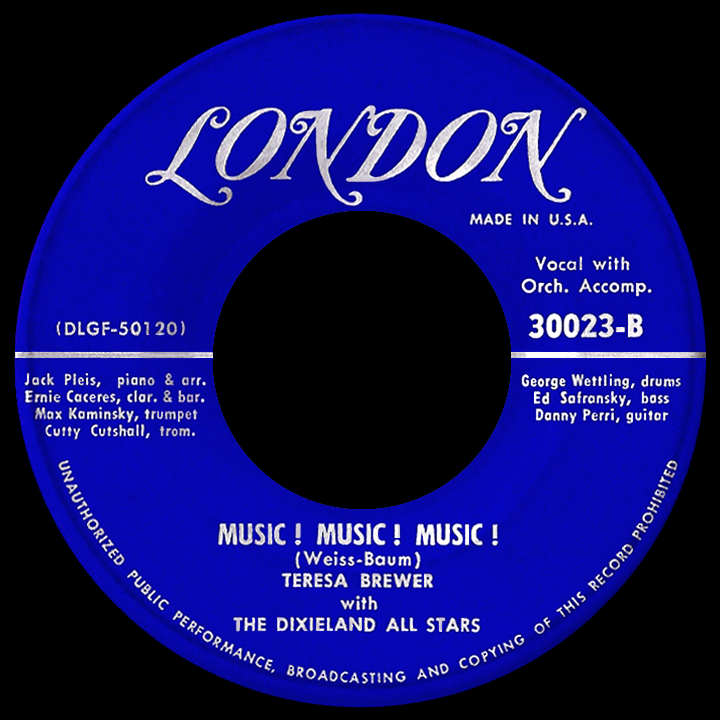 The song hit number one in March 1950, a spectacular way to start a recording career, even if it wasn't the original plan. Two hits followed on London, "Choo'n Gum" (built around a children's chant and set to a tune that originated in George Gershwin's An American in Paris) and the ballad "Longing For You." In 1951 she switched from the British-based London Records to U.S. label Coral. The first few releases were creative though middling hits, including "Gonna Get Along Without Ya Now" (a bigger hit when Patience and Prudence remade it in 1956) and "You'll Never Get Away," a fun romantic duet with labelmate Don Cornell, one of 1952's breakout singing stars. 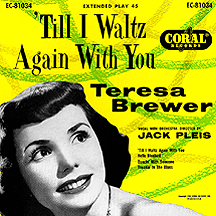 The old fashioned approach with song choices and arrangements was working well for the youthful-sounding Teresa, and she scored the biggest hit of her career with "Till I Waltz Again With You," a ballad written by Sidney Prosen (who later played a key role in the early development of Simon and Garfunkel). 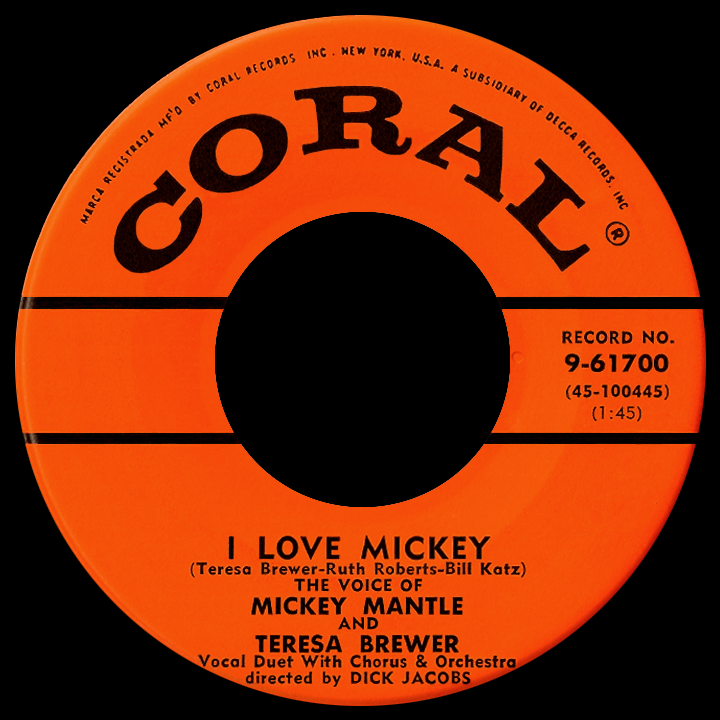 Released near the end of 1952, it reached the number one spot in February '53; many times through the years, Teresa said that it was her favorite of all the songs she had recorded. It was also a favorite of 18-year-old Elvis Presley, who chose it as the first song he ever sang in public during a talent show, about a year before his first sessions at the Sun studios. When the two met many years later, he reportedly told Teresa, "You got me started in the business!" She gained momentum after her second number one hit, scoring big with Larry Coleman, Norman Gimbel and Joe Darion's bouncy borderline-novelty tune "Ricochet" ('I can't live on ricochet romance, no no not me...if you're gonna ricochet baby, I'm gonna set you free! '), a near-chart-topper in its own right. A high profile artist by this time, the natural redhead welcomed the opportunity to act in a Hollywood movie, Those Redheads from Seattle, co-starring with Rhonda Fleming, Agnes Moorhead, Gene Barry and fellow singing star Guy Mitchell. Receiving less than favorable reviews, the 1953 musical set in Alaska turned out to be her only appearance on the big screen. A minor hit, "Baby Baby Baby," was performed by her in the film. 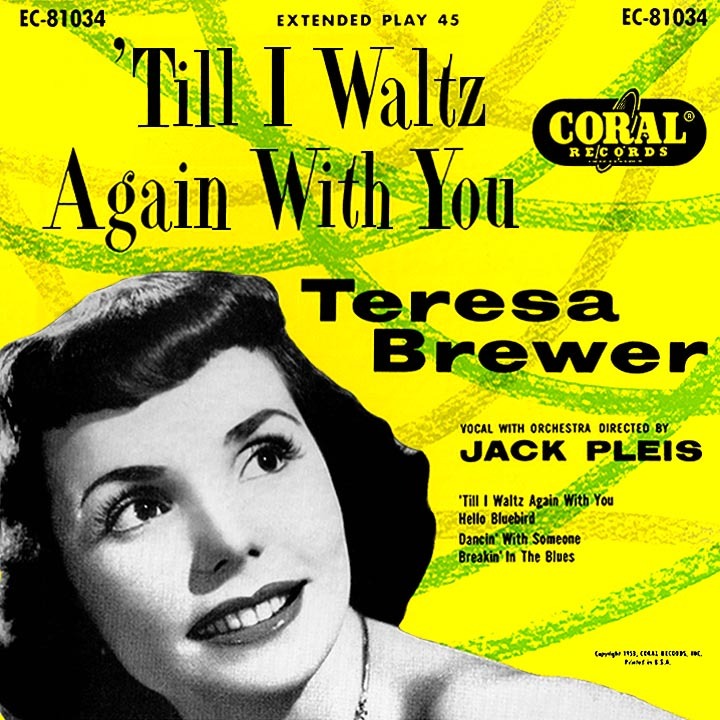 If Teresa seemed a bit like a displaced jazz or big band type of singer from an earlier era, her considerable popularity in the early '50s overshadowed it. "Bell Bottom Blues" certainly had a band era sound and "Jilted" came off as "Ricochet" meets "Music! Music! Music!" After hearing Joan Weber's performance of "Let Me Go, Lover!" an unprecedented six times on a November 1954 installment of the CBS show Westinghouse Studio One, she quickly made her own recording of the Jenny Lou Carson-Al Hill song with backup by Coral vocal group The Lancers (who never quite managed a hit of their own). The cover version went top ten, yet trailed Weber's phenomenal one-shot hit, a chart-topper in January 1955. Teresa tried going the TV promotional route herself, with "Shoot it Again," introduced on CBS's U.S. Steel Hour to far less fanfare. Ballads were her preference and the Dorian Burton-Eugene Randolph song "A Tear Fell" fit the bill perfectly, returning Teresa to the top ten in the spring of 1956. She had avoided anything remotely rock and roll to this point, but that changed with the single's flip side, "Bo Weevil," a Fats Domino-Dave Bartholomew song released by Domino at the same time. Her rousing rendition, leaning much closer to a big band arrangement than the original, was actually the bigger hit of the two. In addition, there was "A Sweet Old Fashioned Girl," a Bob Merrill song that drew a comparison between the notion of an innocent teenager of an earlier decade and a "modern" girl of the '50s, '...a frantic little bopper in some sloppy socks, just a crazy rock 'n' rollin' little Goldilocks!' Though in her mid-twenties, her voice was tailor-made to the song's teen-centric lyrics; it was a top ten hit more in the rock and roll vein than anything Teresa had done before or would ever attempt afterward. 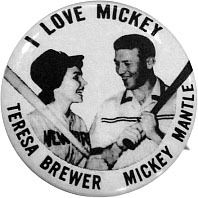 So, just how strong was Teresa's attraction to New York Yankees slugger Mickey Mantle? It's been suggested that he thought she was pretty nifty, too. 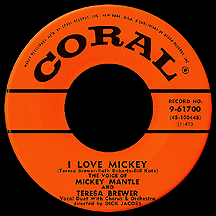 They got their chance to flirt with each other in the studio, at least, after she attended a Yankees game and came up with the idea for "I Love Mickey," written with the help of Ruth Roberts and Bill Katz. "The Mick" went along with making the record and received top label billing, despite his inability to sing and difficulty in even hitting his 'Mickey who?' mark. Still, everyone involved had fun and the resulting novelty track became one of the most popular baseball-related songs of all time. Other hits include Matt Dubey and Harold Karr's "Mutual Admiration Society" from the Broadway musical Happy Hunting (set in the Monaco of recently-wed Prince Rainier and Grace Kelly), starring Ethel Merman and Fernando Lamas. The song was recorded by a number of duet acts, with Brewer's solo recording the one notable exception...and best-selling of the bunch. "You Send Me" near the end of 1957 followed a pattern not unlike "Let Me Go, Lover!" a few years earlier, with Teresa's take on the Sam Cooke song hitting strong, yet far below Cooke's breakthrough original, a number one hit. Then she literally went commercial, jumping right into the '58 ellipse of Wham-O's hula hoop craze with "The Hula Hoop Song." Having kept a consistent presence on TV variety shows throughout the decade, Teresa joined Tony Bennett as co-host of NBC's Perry Presents (a summer replacement for Perry Como's variety series) in June and July 1959. She continued hitting the charts into the early '60s, supplying the English translation of Edith Piaf's benchmark '61 French classic "Milord," among others. She moved to the Philips label in 1962, her hitmaking days behind her, and continued recording for the next few decades on several different labels, enjoying hits in various countries from time to time. 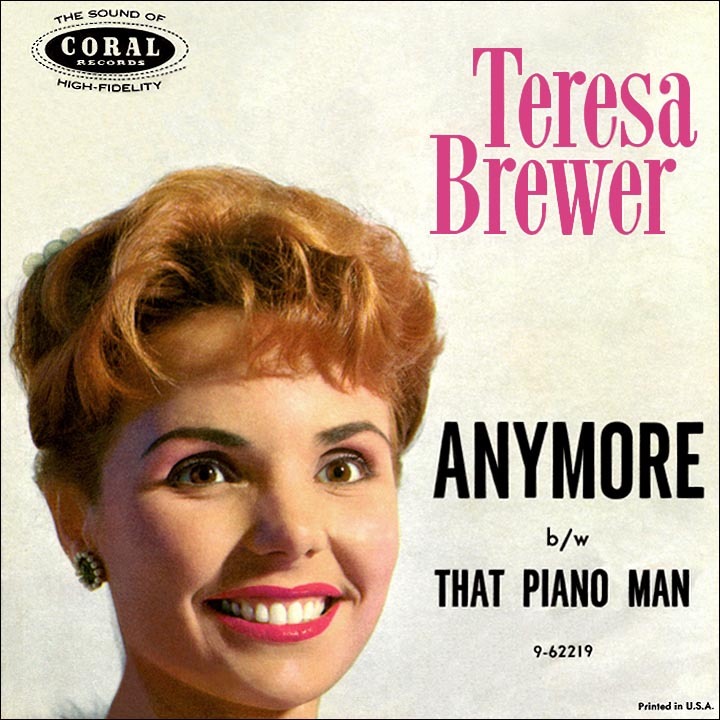 Teresa Brewer's ties to television remained unbroken; a favorite of Ed Sullivan, she made several appearances on his show during the 1960s and popped up regularly in the '70s on The Tonight Show starring Johnny Carson, also a fan. One of her last appearances put her smack dab in the middle of Kermit, Gonzo, Miss Piggy and the gang on a 1977 episode of The Muppet Show.